We had a lot of fun discussing the book… and learned that cracking a whip was a lot harder than we thought. Loved The Whip! – Sandy Rogers, Hags on Nags Saddle Club – Wisconsin. Hags on Nags Saddle Club, Wisconsin. Written Words Bookstore – Shelton, CT. The ladies of LLC Book Club so enjoyed its monthly book discussion at Cafe la Dolce. All agreed that “The Whip” was an exciting read, filled with unexpected turns. It was a vivid reminder of how far women have come. One member mimicked the crack of a whip, adding- we enjoyed the ride tremendously! 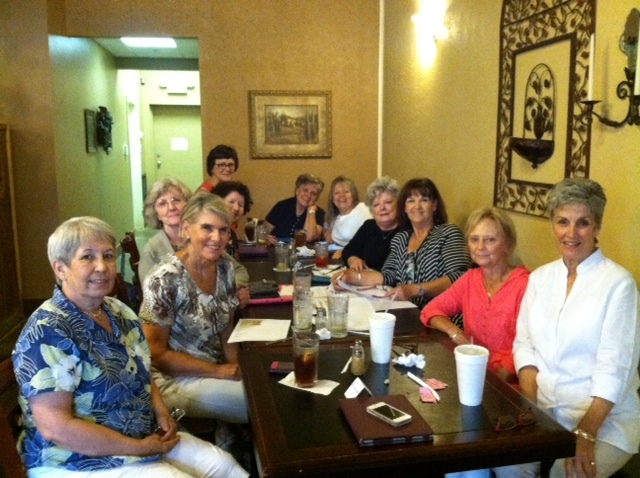 The ladies of LLC Book Club (Covington, Louisiana) happily discuss the fun twists and surprises in “The Whip.” What fun! On behalf of the Melting Pot Book Club we thank you for your wonderful story. We all gave you a thumbs up and look forward to more of your writing. Thanks for your terrific insight into a daring and clever woman. Wednesday Night Babes Book Club – Richland, WA. Mentor Book Club, Lincolnton, NC. est: 1919. Photo taken at the Willow Creek Inn, Vale, NC. The Pelican Pointe Women’s Association Wednesday Night Book Club – Venice, FL. Karen and the Pebble Beach Book Club – Pebble Beach, CA.